Thanks to media coverage and tips from the public, the driver of the Jeep has been identified. The driver is NOT a suspect. Authorities continue to seek surveillance and cell-phone video shot in the area of the fire between 11 p.m. Saturday night (March 30) and 3 a.m. Sunday morning (March 31). Details below. IMPORTANT NOTE: This is NOT considered a suspect vehicle at this time -- authorities simply want to speak to the driver as a possible witness just before the blaze. The driver (or anyone who can identify the driver) is urged to contact the Clackamas County Sheriff's Office ASAP. VIDEO FROM 4-HOUR WINDOW AROUND FIRE STILL SOUGHT: The Jeep was spotted during analysis of surveillance video gathered from around the fire scene. Authorities continue to seek surveillance and cell-phone video shot in the area between 11 p.m. Saturday night (March 30) and 3 a.m. Sunday morning (March 31). Anyone with video or additional information is urged to contact the Clackamas County Sheriff's Office Tip Line -- by phone at 503-723-4949 or by using the online email form at https://web3.clackamas.us/contact/tip.jsp . Please reference CCSO Case # 19-007264. NOTE TO THOSE PROVIDING VIDEO: To assist investigators, those providing video are asked to note each video's date, time, and filming location. This will help detectives as they reconstruct the evening and the events leading up to the blaze. INVESTIGATION CONTINUES: Investigators are still gathering and processing information and evidence, and will offer no additional details on the case at this time. The fire scene was processed by personnel from the Oregon State Police and the Bureau of Alcohol, Tobacco, Firearms and Explosives; the investigation is being led by Clackamas County Sheriff's Office detectives. As a precaution, cadaver dogs from NORSAR searched the scene, but found no human remains. And Tualatin Valley Fire & Rescue continues to provide invaluable assistance to investigators. Additional photos from the incident are attached. 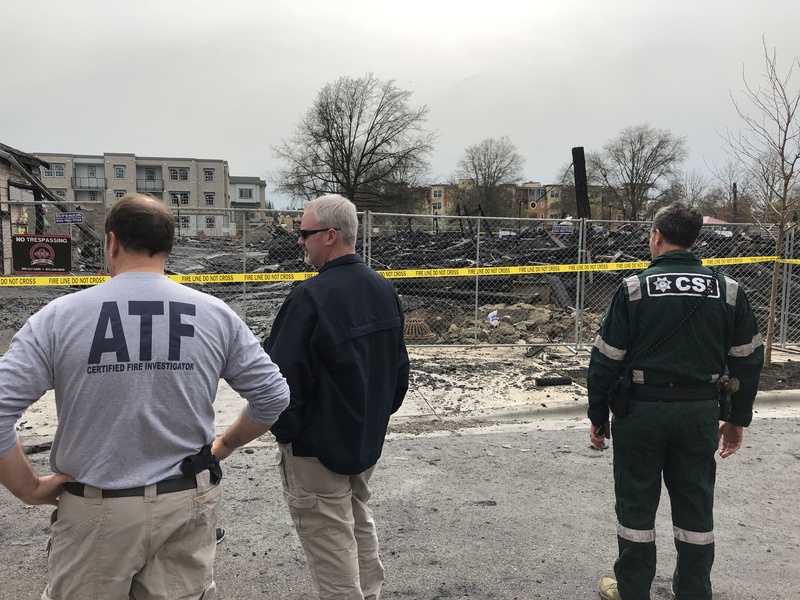 As the investigation continues, the fire investigation team -- comprising personnel from the ATF, Oregon State Police, and Clackamas County Sheriff's Office -- is still looking for video from the Villebois neighborhood. Specifically, authorities are looking for video from the early morning hours of March 31, 2019 -- including cellular phone video or surveillance video such as doorbell cameras, home security systems, or business surveillance that could assist with the investigation. This includes not just the area around the fire, but other parts of the Villebois neighborhood. Anyone having such video should contact the Sheriff’s Office Tip Line — by phone at 503-723-4949 or by using the online email form at https://web3.clackamas.us/contact/tip.jsp. Please reference CCSO Case #19-007264. An additional photo of vehicles damaged by the blaze is attached. A CLARIFICATION: We are gathering information as if the fire were a criminal investigation because we only have one opportunity to get it right -- but cause and origin have NOT been determined yet. There are dozens of criminal investigators diligently working on this case. We appreciate the neighborhood’s patience and support during this time. The Wilsonville Police is partnering with the Clackamas County Sheriff’s Office, Tualatin Valley Fire & Rescue, Oregon State Police, the Alcohol Tobacco and Firearms (ATF) to investigate this incident. Currently the sheriff’s office has detectives, crime scene technicians, analyst and deputies devoted to this investigation. The Clackamas County District Attorney’s Office has a representative as well. After the scene is determined to be safe, investigators will work to determine the cause and the origin of the fire. If you have property that was damaged due to this fire, please contact the sheriff’s office to file a report. Non-emergency dispatch can be reached at 503-655-8211. Anyone who may have information useful to this investigation is encouraged to contact the Sheriff’s Office Tip Line — by phone at 503-723-4949 or by using the online email form at https://web3.clackamas.us/contact/tip.jsp. Please reference CCSO Case # 19-007264. Three Clackamas County cities -- Estacada, Happy Valley and Wilsonville -- contract with the Clackamas County Sheriff's Office to provide municipal police services. Anyone wishing to contribute in the form of donations to the displaced victims of this fire, you are asked to contact the American Red Cross. 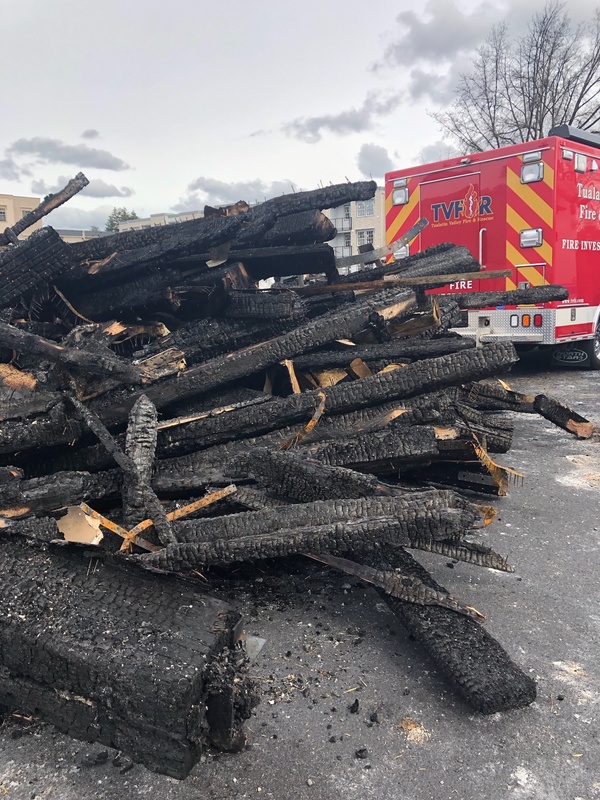 The Clackamas County Sheriff’s Office Detective Division is working with Tualatin Valley Fire and Rescue personnel and an Oregon State Police Investigator to determine the cause of this fire. As part of this investigation we are asking the public, specifically those who live in the area or happen to have been in the area at the onset of the fire to contact the Clackamas County Sheriff’s Office tip line (see below) if you recall anything suspicious. The cause of the fire has not been determined however, we would like hear from residents in the area who have home video surveillance that captured anything suspicious to include vehicles or people in the area during the fire or prior to the start. If you saw something suspicious or discover it after reviewing your surveillance please contact the sheriff’s office via the tip line and an investigator will contact you directly. At this time there is no new information regarding this investigation to provide to the public. There will be an enhanced law enforcement presence in the area due to this investigation and for security of the scene. This will continue during this investigation. Public information release regarding this incident will be handled through a cooperative effort between the Clackamas County Sheriff’s Office and Tualatin Valley Fire and Rescue. Anyone who saw something suspicious or has surveillance footage of someone or something suspicious is urged to call the Clackamas County Sheriff’s Office Tip line at 503-723-4949 or leave a tip at https://web3.clackamas.us/contact/tip.jsp -- please reference CCSO Case # 19-007264. 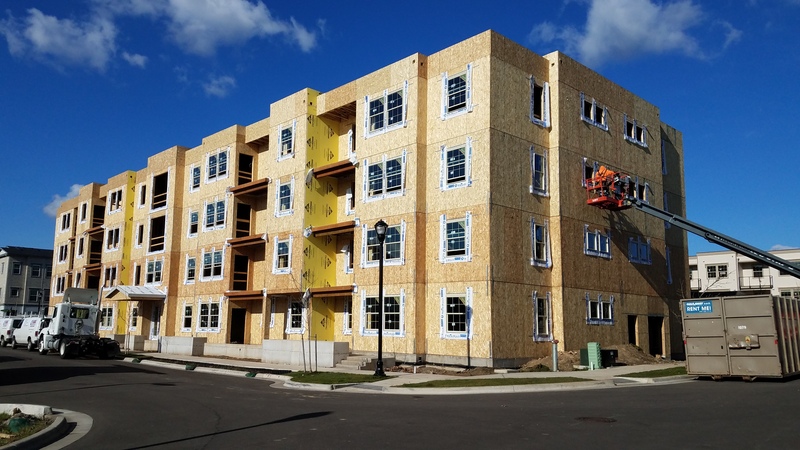 Just after 1am this morning, multiple callers to 9-1-1 reported that a three-story apartment complex under construction in the 11000 block of SW Collina Lane in Wilsonville was engulfed in flames. A bright orange glow and column of smoke could be seen from several miles away. By 1:15 a.m., fire commanders called a third alarm to bring enough firefighters to the scene to evacuate residents, extinguish fires in occupied buildings, control the original fire and protect exposed buildings. In addition to TVF&R, fire crews from Lake Oswego Fire Department, Canby Fire District, Aurora Fire District and Portland Fire & Rescue worked through the night. The fires were considered under control around 4a.m. Firefighters will remain at the site through Sunday morning to keep the burned pile of debris cool and make sure hot spots don’t flare up at nearby homes that were burned. At least twenty occupied condominiums sustained significant fire damage or will be considered a total loss. Dozens more had blown out windows or siding damage due to the intense radiant heat from the original fire. 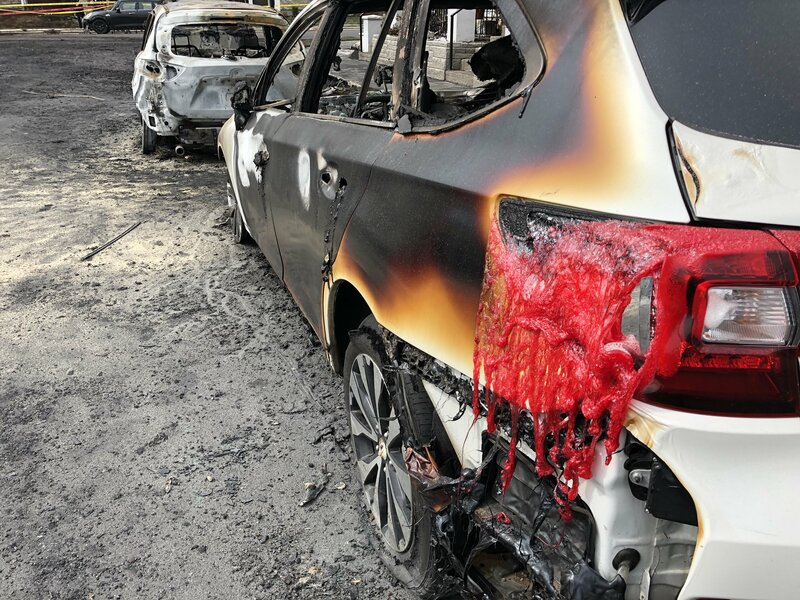 An additional construction shack, some construction equipment and approximately 14 cars and trucks were destroyed. Many people were displaced because of this fire. Fortunately, none were injured. Those who aren’t staying with friends or family are being assisted by the American Red Cross who provides temporary housing and vouchers for food, medicine or other necessities. So far, approximately 25 people were being helped at the scene. Fire investigators have begun the extensive process to try and determine where and how this fire started. They will continue conducting witness interviews, examining physical evidence and evaluating video surveillance footage. In addition to partner fire agencies, TVF&R is grateful for assistance from the American Red Cross, the City of Wilsonville, Washington County Consolidated Communications Agency (9-1-1), Wilsonville PD (Clackamas County Sheriff’s Office), PGE, NW Natural, and Clackamas County.